I seem to have read more library books than anything else this year, and here's another one. 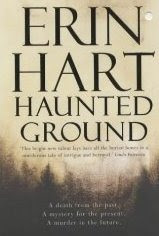 Haunted Ground by Erin Hart was recommended to me by an American friend and as I'm *trying* not to buy so many books this year (which is quite laughable seeing as I just ordered three of Anne Perry's Inspector Pitt books from Amazon) I was really pleased to find it in the library. A farmer digs up a severed head in a peat bog in the west of Ireland. The experts are called in - archaeologist, Cormac Maguire, and American pathologist, Nora Gavin. These two had an older 'mentor' type friend in common who is now dead, the friend having been keen that they get together romantically. They never did so there is some slight awkwardness and history existing between the two. As they arrive from Dublin to see the head, a local land-owner, Hugh Osborne, also arrives. His wife and son went missing several years ago and he's anxious to see if the head might be that of his wife, who was of Indian origin. It's not. It's a red-headed girl and no one has any idea how long her head has been buried in the bog. Hugh Osborne asks Cormac to excavate a site on his land where he plans to build. Nora is intrigued by both the newly discovered head and the disappearance of Mina and Christopher Osborne, as she herself has lost a sister in suspicious circumstances. So she asks Cormac if she can help him so that they can covertly investigate the disappearances and also try to find out more about the red-headed girl. They stay at Hugh's manor house and meet his cousin, Lucy, and her son Jeremy. They also get to know the family of the farmer who found the head, the McGanns. All of them clearly have secrets they're not keen to share. Nora and Cormac set about investigating not only the mystery of Hugh's wife and child but also delve into local history to find clues to who the red-headed girl might be. The mystery aspect of the book was very good too. I liked the way the author tied in the stories of the missing persons with that of the red-headed girl, anyone interested in Irish history would enjoy this I would imagine and I felt like I learned a lot. I didn't guess whodunnit or how the crime was committed - the how and the why was actually more important than anything in the end. Not that that matters too much to me as I can sometimes guess whodunnit right at the start of a book and it makes no difference to my enjoyment. Archaeology-wise I'm no expert and can't vouch for the accuracy of any of the methods used. An expert might be thoroughly annoyed by mistakes for all I know, or it could be spot-on. All in all not a bad read. A good setting, a good mystery, good historically. It *possibly* would not have harmed had the story been a little more pacey but that's a minor quibble. I'll certainly grab more books by Erin Hart if I see them at the library and, in fact, I think there *are* a couple more books with these characters. And I seriously need to go to Ireland! 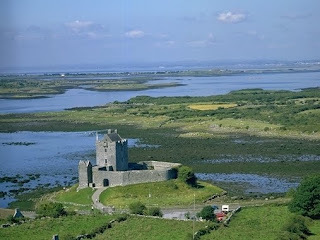 Dunguaire Castle near Kinvara, Co. Galway. 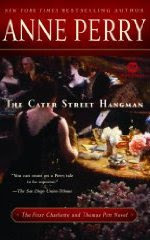 Well now, The Cater Street Hangman is a book I've been meaning to read for years but, like a lot of books, I've put it off and put it off. Two things have prompted me to pick it up at last - my reading of a couple of Anne Perry's Christmas books, which I've enjoyed very much, and the fact that I'm in a Victorian mystery sort of mood at present. Add to that, that Kay at My Random Acts of Reading made mention of this first book in the Charlotte and Thomas Pitt series, and it seemed like it was time to take the plunge. The Ellison family live quietly in London. The father, Edward, a banker, considers himself very much the head of the household and his word is law. He and his wife, Caroline, have three daughters - Sarah, the eldest, married to Dominic and still living at home, Charlotte, a spirited girl who says exactly what she thinks without thinking beforehand, and Emily, the youngest, an ambitious girl who wants more than anything to marry well and to marry money. When the murders begin in their street the family at first try to stay aloof. Edward tries to keep the news from his wife and daughters on the basis that he doesn't want them tainted by it. But events overtake them - the family know one of the murdered girls and the police, who won't take no for an answer, arrive to ask questions - some of them embarrassing. Heading the police investigation is Inspector Thomas Pitt, a quiet but determined young man, who, it appears, has taken rather a shine to Charlotte. The family are still attempting to stay aloof, treating the police with distain, and continuing with their daily routine as though nothing had happened, when one of their maids is found dead and mutilated in the street. If they thought things were bad before they are now horrified as Inspector Pitt begins turning up at all hours to question them minutely about their activities - especially the men. It seems Edward and Dominic both have secrets... but could they commit murder? Charlotte, in love with her sister's husband for years, is horrified and the only person who can help clear up the mess is the detested Inspector Pitt. I expected this to be quite a light-weight book and in a way it was; it's very easy to read and I zoomed through it rather quickly. But dismissing it that easily would be doing Anne Perry an injustice because this is not just a crime/mystery story. The various layers of Victorian society are all here in this book. The class-ridden snobbishness the well-off used when dealing with anyone of a lower class, the double-standards of men, requiring their wives and daughters to be complete innocents while actively taking part in some rather dubious, extra-marital, sexual activity, women, completely frustrated at not being allowed to be full members of society, the hypocrisy of the church, and so on; it's all here. To tell the truth I was really quite taken aback by some of it, even though I've read Victorian history and sort of knew. The father's censoring of the newspapers so that the women only heard the news he read out to them and had no idea what was going on in the world, angered me no end. And the appalling attitude of the middle-classes to the police. They were happy for them to investigate crime it seems, as long as they didn't have to have them in their houses. And woe betide any policeman who was overly familiar or even treated the middle-classes as equals! More than anything though, I was sorry for the women. Intellectually frustrated, often trapped in loveless or dictatorial marriages, it must have been appalling. And that's just the middle-classes. Compared to the appalling conditions the working classes were expected to endure they had it very easy indeed! Such an interesting subject and I plan to read a lot of more of these Thomas Pitt novels (there are over twenty) because I bet you any money Anne Perry doesn't let up on her dissection of the diseased innards of Victorian society and I *really* want to read more. It's half-term next week and my grandaughter is coming to stay so, in order to get my reviews up to date, I'm going to do two shortish ones of my two latest reads. First up, Daddy-Long-Legs by Jean Webster. Jerusha 'Judy' Abbott is an older girl living in an orphange in New England at the beginning of the 20th. century. She would like to go college but knows the likelihood is nil until one day she's called into the office and given some news. Apparently, one of her essays was read to the trustees of the orphanage and caused much hilarity. Because of this one of the trustees has decided to sponsor her through college. The only stipulation is that she must write to him every month, telling him about her studies and life at the college but she can never know who he is and never expect an answer. What a delightful book. I read about it on Nymeth's blog recently and reserved it from the library. It's literally pure charm from start to finish. Judy is full of enthusiam and gratitude that her life is now changed out of all recognition and she reminds me of Anne Shirley to be honest. The similarity is quite marked. The author, Jean Webster, neice of Mark Twain I believe, was a reformer and amongst the charm there are strong hints of Judy's hard life at the orphanage and the differences between her and her very well-off room-mates at college. Yes, it is a very light, romantic type read, but it also has a point to make, and make it it does. I loved it to bits and have reserved its sequel, Dear Enemy, from the library. 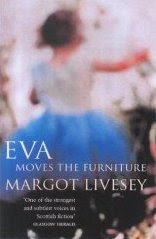 Next, Eva Moves the Furniture by Margot Livesey. Eva McEwan lost her mother just after she was born and is being brought up by her father, David, and Aunt Lily in 1920s Scotland. Unbeknownst to anyone, Eva has two companions, both ghosts, a young girl and an older woman. She has no idea who they were when alive, but sometimes they act as her protectors and sometimes she has reason to question their motives. I found the rec for this book on Alice Hoffman's FantasticFiction page. Often authors on that site will recommend other books and it's a good place to find book recs I find. Anyway, Eva Moves the Furniture might sound like a ghost story but it's not. There are ghosts, yes, but the book is more about growing up, loneliness, loss, falling in love, the intense love of your children and so on. An ordinary life in other words but a fascinating one none-the-less. I found the section about nursing during WW2 to be particularly interesting - Eva works on the ward that reconstructs the faces of burned soldiers and it's both rivetting and harrowing. The last few chapters made me cry and not many books do that as I think I've said before. This is an intense book, but not written in a dramatic fashion... all is stated matter-of-factly so that shocking things are made even more shocking and often take the reader completely by surprise. I've no idea why I'd never heard of Margaret Livesey before this. Her writing feels very similar to that of Alice Hoffman or Barbara Pym and is well worth reading if you don't necessarily need a happy ending all the time. I shall certainly be reading more if I can find it. Todd Hewitt is a boy. He is in fact the only boy left in Prentisstown. In one month precisely he will be thirteen and will become a man. After that there will be no more children left in the town. Todd lives with his two guardians, Ben and Cillian, both his parents having died. The story opens with Todd down at the swamp having been sent there by Ben to collect apples. The boy likes to go there because it's one of the few places where he can go to escape 'noise'. Noise is the combined thoughts of all the men in Prentisstown. When humans came to colonise the planet they found it already inhabited by a species known as Spackle. A war ensued in which the Spackle used germ warfare and the result was that, although humans won, their thoughts are no longer secret. But there was a twist and the twist was that it was only the thoughts of 'men' that could be read. The disease didn't affect women in the same way so although they could read the minds of men, men couldn't read the minds of women. Sadly, the disease also killed off all the women in the town. Okay, well all of that might sound like huge spoilers but in fact it's all revealed within the first chapter or so - this is one fast moving and pacey book! It's also a book that's almost impossible to talk about *without* spoiling so I'm not going to say a lot about it. The secrets are the best thing about this book. From start to finish you're kept guessing and some of it occurs to you and some of it doesn't and just when you decide on one thing it's turned on its head by further revelations. The book is written in an unusual manner, rather stream of consciousness and, in places, spelling that isn't quite right. I thought that would bother me but it didn't, it underlined the fact that Todd is uneducated and how much that *matters* throughout the story. Truthfully, this quite a shocking book. Dystopian in nature, although set on another world, feminist in nature too I felt, though others might disagree. If ever a book was thought-provoking then this is it. It's also a huge roller-coaster ride - from start to finish it never lets up, never relaxes... 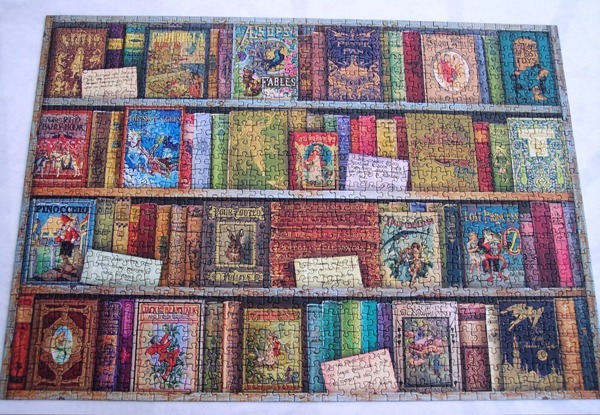 I felt quite exhausted when I'd finished! But in a good way, like I'd just read an amazing, unique, brilliant book that I loved to bits and wanted to tell everyone about. So I told my eldest daughter yesterday and she said that she'd read the first 30 pages a while ago and abandoned it. I was so shocked I didn't know what to say. How to tell someone they've been silly and missed something brilliant without offending them? Ack! My husband is going to read it though and I'm agog to hear what he thinks. Any complaints? No, just questions. One big one to be honest but I've no one to ask an opinion of and maybe that will be answered in the next book, The Ask and the Answer (which is already out) and maybe it won't. Because this is a book for young adults and my question is a very adult one. And that underlines the problems YA authors must encounter when writing science fiction, or anything else for that matter, for children... even when it's older children. How far do you go? Jennifer Donnelly in A Gathering Light went pretty far in telling it like it was but it must be a real problem and it'll be interesting to hear if Patrick Ness deals with it or ignores it altogether. We'll see... and I really, *really* can't wait. I'm getting really bad at remembering where I've seen certain books blogged about or who recommends things to me. 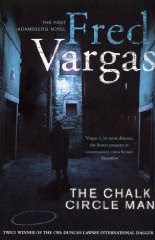 I know Nicola wrote about The Chalk Circle Man by Fred Vargas here on Back to Books, but there were others so if it was you, please shout. Anyway, whoever it was, I'm really glad I took notice. The new commissaire of the police headquarters in the 5th arrondissement in Paris is 45 year old, Jean-Baptiste Adamsberg, originally from near the French border with the Pyrennees. He's a quietly spoken, relaxed, quirky sort of man but a very good detective indeed. When a series of items start appearing, surrounded by blue chalk circles, people are amused and intrigued. But Jean-Baptiste is not. The circles are always done at night and in secret and it's clear the perpetrator is teasing... or is he? Items chosen to go in the circles are bizarre - cigarette lighters, bottle tops, watch straps, a pigeon's foot... and then a dead cat. Jean-Baptiste foresees somethings awful happening and sure enough it does when the body of a woman turns up next: her throat has been slit. The police can do nothing but wait for the next victim and it's an elderly male doctor this time, followed some nights later by another woman. The police have a serial killer on their hands. While all this is going on a woman turns up at headquarters. 'Mathilde' is worried about a blind man who has gone missing. Slowly Jean-Baptiste gets to know this odd woman who follows random people in the street and picks up waifs and strays... and learns about the people she lives with. 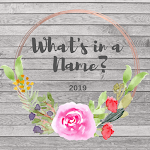 Mathilde claims she knows who The Chalk Circle Man is; Jean-Baptiste is both intrigued and thoroughly alarmed... what is the connection between this rather eccentric woman and these horrendous crimes? Well, I started this book on Sunday and finished it on Monday. From that it can be deduced that, yes, it's a quick read, but also that it's a compulsive one. I just could not put it down. I liked the French detective, Jean-Baptiste Adamsberg, very much indeed, with his unusual way of doing things and his almost lazy approach to his work. Not only that, it was interesting meeting his second in command, Danglard, who drinks too much and freely admits he's 'no good to anyone come four o'clock in the afternoon'. I also found Vargas's other characters well rounded and different, Mathilde and her blind friend, Charles, particularly, and 70 year old Clémence who's adicted to the small dating ads in the papers. All nicely drawn. The mystery itself was excellently done with a few twists and turns and bizarre occurances. I had suspicions of what was going on as I went along and in the end I was sort of right - but sort of not. It was quite complicated and I had to think hard, which is always fun. I don't really have any complaints. I kind of wish I'd been to Paris and was familiar with the city's atmosphere and streets, but I haven't so there you go - it made no difference as far as I can tell. The book was beautifully translated from the French by Sian Reynolds. This is the first in the series but I gather they haven't been translated in order, not that that has anything to do with the price of fish, but it is odd. I certainly plan to track down the rest of them and am looking forward to it immensely. I love the fact that I have about half a dozen different crime series on the go, that I'm really enjoying, and can dip into throughout the year.